During our stay in the Kingdom of Saudi Arabia, there are times when your patience will be tested. This is a direct result of so many people involved in doing whatever you are doing. There will be unusual delays resulting in waiting time to be many long hours. Travelling time also can be long hours. Read our website thoroughly, there are useful links on Hajj and how to prepare yourself for this journey. It is important to follow group leaders instructions for the benefit of the whole group. There may be members in the group who cannot perform the rituals or move swiftly, so be patient with them and try to accommodate them. Hajj is not meant to be a picnic or vacation, it is meant to be rewarding from the good deeds performed. Dawat-e-HajjUmrah or its affiliates will not be responsible for your medical condition. You are advised to take extra medications during your trip in case of unpredicted delays from airlines or any other source. Dawat-e-HajjUmrah will assist in the event of an emergency but their services will be limited. Dawat-e-HajjUmrah is not responsible for your money or valuables. You are advised to keep your money in your possession at all times. Try to make special pockets on your clothing with special zippers to keep your money safe. Keep suitcases locked. Dawat-e-HajjUmrah is not responsible for lost suitcases through airlines or otherwise. If your suitcases does not arrive with you on the flight in Jeddah, Dawat-e-HajjUmrah group leader will inform the airline. After that, it is up to the airline to locate the suitcase. Suitcases must be visually checked during group movements. The Hujaaj must ensure that their suitcases are loaded and unloaded on buses or other vehicles transporting the luggage. 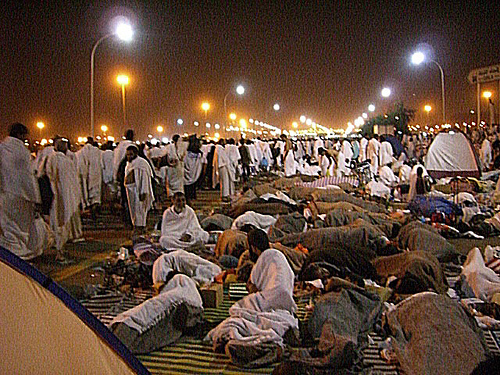 Every Hajj group is allocated to an office in Saudi Arabia during the Hajj. The office will have a number. Make sure you get that number before leaving the USA. 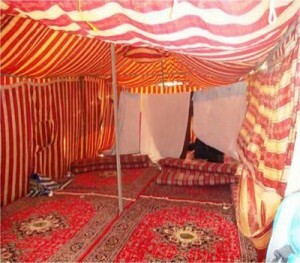 In Mena tents, there are spaces allocated for every Hujaaj by the Hajj Officials. Dawat-e-HajjUmrah will abide by the rules set forth by the officials and WILL NOT dispute any such rulings. Dawat-e-HajjUmrah is NOT responsible for anyone snoring heavily during sleeping in tents in Mena. We advise all Hujaaj to be patient with situations like this and they should NOT be complaining to the group leaders for this discomfort. This is a struggle and more you are patient, the more it is rewarding. The Hujaaj must control food intake to avoid using bathroom excessively. Bathrooms are not the same like in the USA. Most of them are designed to be used in a squatting position. All transportation used during the “Days of Hajj” is by Government buses. Delays and waiting time during these days is unavoidable because of the crowd. Patience must be exhibited. Dawat-e-HajjUmrah will provide one meal in Mena and Arafat. Tea and coffee will also be provided by Dawat-e-HajjUmrah in Mena. All Hujaaj will be advised on what additional foodstuff to take with them for the Hajj days. Dawat-e-HajjUmrah does not provide transportation from Mena to Masjid Al-Haram for Tawaaf Al-Ifaadah. Cost is about 50SR each way. This is equivalent to about $13.00 USD each way. Dawat-e-HajjUmrah does not provide wheelchairs in Saudi Arabia. We will advise and assist if necessary but services will be limited. Identifying landmarks is very important so as not to get lost. Every Hujaaj must be sure to look for signs or something they can remember easily especially in Mena. From the time of arrival in the Kingdom, DO NOT go out alone because you are strange in that environment. Always try to let someone know where you are going even if you are going to the bathroom. During your stay in the Kingdom, it is advisable to drink bottled water at all times. Bottled water is plentiful during the Hajj season. Every as soon as inside a although we choose blogs that we study. Listed beneath would be the most up-to-date web-sites that we pick. Please go to the web-sites we follow, including this 1, as it represents our picks through the web. The information talked about in the article are some of the top available. We are unique and fast growing Travel Company. Today, we are proud of the achievements we have made through our dedicated and highly experienced employees who have immensely contributed to our consistent growth. Our main Travel Partners include an extensive number of established giants in the leisure industry across the globe. Dawat e Hajj Umrah Services Pvt Ltd.